Rheidol Visitor Centre and Power Station01970 880667work Industrial HeritageThe Rheidol hydropower plant is the largest of its kind in England and Wales. Since 1962, the scheme has generated renewable energy by using the rainwater that falls on the surrounding mountains. Located within and above the scenic valley of the river Rheidol near Aberystwyth in Mid-Wales, the hydropower plant is made up of an interconnected group of reservoirs, dams, pipelines, aqueducts and power stations, and covers a total area of 162 square kilometres. The annual energy production is about 85 GWh – enough to power approximately 12,350 homes. The upper reaches of the scheme are over 750 meters above sea level up in the remote Plynlimon mountain range. A series of aqueducts collects the water and channels it into the Nant-Y-Moch reserviour. Water flows from this reservoir to a power station at Dinas where it drives a 13,000 KW generator. From the power station, the water flows into Dinas reservior. Entry into the visitor centre and tours of the station are all free of charge. The Visitors Centre has interactive educational models for the younger generation who want to learn about renewable energy as well as a café for those who want a quiet cup of relaxing tea. The environment is central to the work at Rheidol hydro-electric power station who work closely with the Environment Agency regarding our operation and the site includes SSSI areas and vast heather beds. Rheidol is close to the local Red Kite feeding centre, so kites and buzzards are common the area. Bat colonies have set up home in and around the visitor centre buildings which have been refurbished with due consideration of the preservation of the bats and the centre has set up boxes for barn owls and have many other small birds that nest on site,including swallows and wagtails. The River Rheidol is an integral part of the Rheidol hydro-electric scheme and also a breeding area for salmon and trout. The fish originally had to pass Trotter’s Falls to reach their spawning grounds but when the Falls were replaced by a new dam, weir and bridge at Felin Newydd a special 'fish lift' constructed to allow the fish to reach their old spawning grounds. Upstream of the power station a 'fish ladder' was cut into the rock to bypass the Rheidol Falls and thus opened up new spawning grounds to the fish. The fish ladder rises 6 metres and has 14 pools. The Rheidol hydropower plant is the largest of its kind in England and Wales. Since 1962, the scheme has generated renewable energy by using the rainwater that falls on the surrounding mountains. Brown and rainbow trout are reared at Cwm Rheidol in specially constructed tanks alongside the power station. These fish are put into Dinas Reservoir. This provides anglers with a put-and-take fishing facility. Some of the brown trout are also stocked into Cwm Rheidol and Nant-y-Moch Reservoirs, to help support the indigenous population. The centre is open at Easter Weekend, and from May 1 until September 30, every day between 10:30 and 16:15. 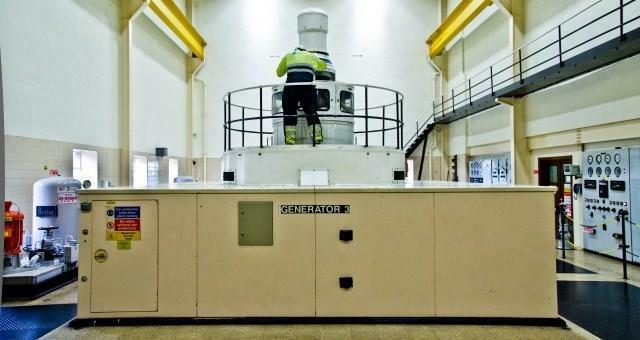 Pre-booked tours of Rheidol Hydro-Power station are available with prior notice. Turn off the A44 (Aberystwyth -Llangurig road) at Capel Bangor towards Cwm Rheidol. Follow the road 4 miles down the valley. The nearest train station is at Aberystwyth, and public transport operates along the A44. The signposted Rheidol Cycle Trail which begins in Aberystwyth, terminates at Cwm Rheidol.